3rd Students is a group that brings real faith and real life together for 7-12th grade teens. We do this through weekly worship, small groups, youth leadership development, annual events, service projects, and spiritual retreats. In addition to Sunday morning worship, our main gathering is on Wednesday nights from 5:30-8:00pm in the youth facility, which is on the 2nd floor of the E&A building. Youth are also invited to join the youth ministry at our partner church, FUMC Cocoa Beach, on Sundays, 5:00-7:00pm. 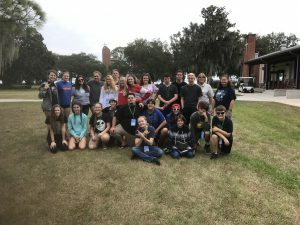 Our mission is to encourage all the youth of Merritt Island to accept Jesus Christ as their Lord and Savior and cultivate a daily walk with him. In this way, they will experience transformation and be empowered to be the hands and feet of Jesus at school and beyond. We would love for you to join us this week!